Everyone is invited for the best Christmas tree lighting event in South Florida Thursday, November 30, 2017. 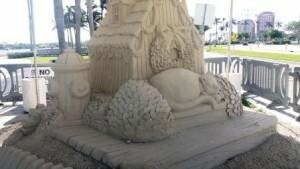 “Sandi’, the world’s only 600-ton, 35-foot tall sand tree is back once more on the WPB Waterfront. 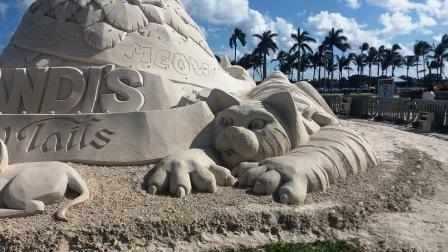 Made of 600 tons of sand, beautifully sculpted and decorated with over 5000 animated lights, Sandi is the centerpiece of the “Holiday in Paradise”. 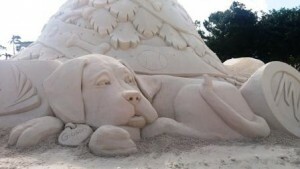 Guests can also see other smaller 25-ton sand sculptures surrounding Sandi. The lighting usually takes place around 7:00 pm and kicks off the month-long Sandi Land celebration. Nonstop Nightly Shows: Light shows will repeat nightly on the quarter hour, Sunday-Thursday from 6:00 p.m. to 10:00 p.m.
Friday and Saturday from 6:00pm to 11:00 p.m. through Dec. 31. Sandi’s Dressing Room: 10 a.m. to 10 p.m.
Behind-the-scenes look into the world of Sandi. This is your chance to go backstage into her decked-out celebrity dressing room for fun photos. 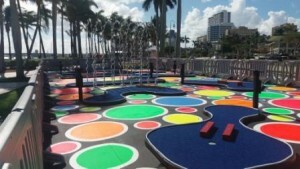 Glow FORE it Mini Golf: Monday-Friday 6 p.m. to 10p.m. SnowieVille: Monday-Friday: 6p.m. to 10 p.m. Create your own life-sized tropical snowman or snow lady with fun mix-and-match pieces and take a seasonal selfie to share. – Non-stop family fun in SnowieVille, including special seasonal kickoff activities such as face painting, a visit from Elsa, star of the movie “Frozen,” and even the Grinch. 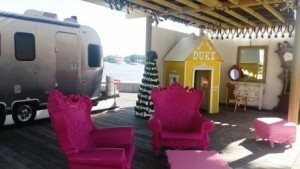 – Guests can also shop for specialty gifts and treasures in the Holiday Gift Boutique, located in the Lake Pavilion. – Santa and Mrs. Claus will also make a special appearance! 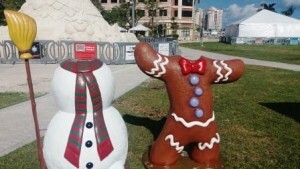 Events - Entertainment, Festivals, Parks in WPB. permalink.